For this historical colour scheme I have taken inspiration from the Georgian era and used a colour palette of powder blue, soft chalky white and an earthy stone colour. Robert Adam was famous for his use of soft blue shades during the Georgian period and many modern interiors, whether they are Georgian or not, have used this colour palette with great success. 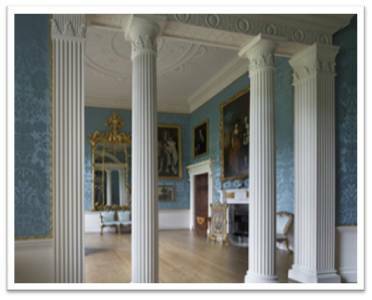 The image below illustrates one of the many interiors designed by Robert Adam (Kedleston Hall), its elegant and refined look is most definitely reinforced by the combination of soft blue and white. My colour palette uses powder blue as the predominate colour, whilst there are many wallcoverings available utilising various patterns etc… (example pictured below), I haven’t included any in this instance because I wanted to focus purely on the restful properties of this colour only – this particular shade of blue is clean, soft and uncomplicated; alongside the use of white (which suggests purity and innocence) it creates a serene, calm and very peaceful atmosphere. I would be inclined to use white for the upholstery of a sofa in this arrangement. The pairing of this soft shade of blue and white is excellent and very effective, so much so that I have included the plasterwork detail of ‘egg and dart’ in my board (and scrolling detail) to fully illustrate just how complimentary they are – together they suggest elegance and classical properties without being pretentious, overbearing or stuffy. Our homes should be considered our sanctuary away from the day-to-day hustle and bustle of outside life – the psychological impact of this colour palette has very obvious suggestions of peace and tranquillity and therefore would indeed add to this feeling of ‘sanctuary’. Whilst blue is deemed a cool colour and might not instantly suggest a homely and inviting quality, the precise soft and delicate shade used in this palette reduces the overall cooling effect. I have included a third equally unobtrusive, calming and warming earthy shade, to add relief from the blue and white colours, and to also add a little weight to the overall colour palette. 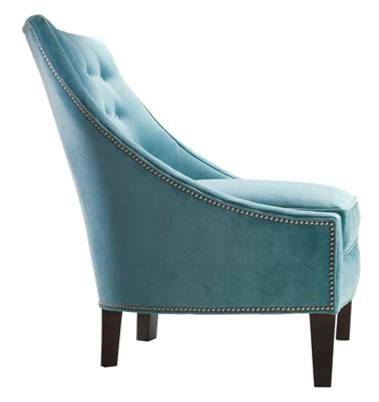 This shade has been included in cushions and fabric samples. I particularly like the delicate white and earthy floral design and feel it would look beautiful as curtain material, especially if it was allowed to gather on a floor. As a nod to the Georgian period I have also included a damask fabric sample that incorporates the powder blue with a deeper shade for a little bit of drama. The soft lines and delicate shade of the swoop chair reinforces the effects of this gentle and understated colour scheme. I have also included a vase that has touches of gold with soft blue – the addition of gold helps to add further warm undertones to this scheme and this element could be explored further by using gold picture frames etc… (the use of gold gilding was extremely prevalent in the Georgian era). The appropriate artificial lighting for this scheme would be the soft hue from a lamp and candlelight, and not the harsh glare from halogen lighting. This would ensure that the overall relaxing and calming effects of this colour palette are enhanced. Considering the colours in this palette are particularly light and would reflect a large percentage of light the perception of space would be a positive one. This colour scheme would most definitely ‘open up’ a space to full potential. The limited use of pattern (only cushions and curtain fabric); the simplicity of this scheme and the fact that only one colour is used on all walls (which would blend the corners/edges of a room) add to its feeling of spaciousness. If indeed a room had high ceilings etc… this particular historical colour palette would only add to its elegant and classical proportions, just as the Georgians had originally intended.